It’s easy to see why Branson cabins at Thousand Hills Golf Resort are considered some of the most popular accommodations in the Ozarks. The beautiful location of Branson cabins in a rustic and tranquil wooded setting provides every family or romantic couple the perfect getaway backdrop. Thousand Hills offer a variety of options for guests in quest of accommodations in log cabins or condos with stunning scenery and a relaxing atmosphere in a calm environment. Branson cabins are just two blocks north of Country Music Boulevard – and yet you see the spectacular rolling rolls of the Ozark mountains. The interior designs of the log cabins are intended to flow with the beautiful surroundings and the natural landscape. Staying in a Branson cabin will let you experience the “at home” feeling it offers. Your wonderful vacation in Branson will let you feel the luxury and comfort in staying in a cozy log cabin accommodation. You have options to choose among units that can sleep 2 people to a maximum of 16. All the cabins at Thousand Hills have great features of free wireless internet access, a cable TV with HBO, and a DVD player. The cabins also feature modern amenities that include jetted tubs, fireplaces, open front and back porches, and a fully-equipped kitchen. 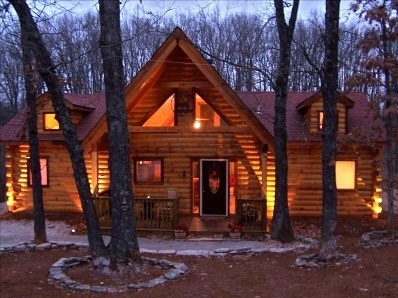 The uniquely designed and well-appointed Branson cabins offer a memorable vacation getaway that you can’t experience in regular hotel accommodation. The people in the Midwest no longer head to the west coast or the east coast to enjoy a variety of entertainment and different culture. In Branson, there are tons of exciting attractions that include world-class live entertainment shows, movies, museums, theme parks, and an endless and expanding array of retail shops and fine restaurants. Thousand Hills Golf Resort in Branson includes rental condos and log cabins that are within the proximity of the entertainment district. Whatever guests want to visit around Branson, they are always accessible from their accommodation. In addition to the sought after Branson cabins at Thousand Hills, guests are offered first-class value with the Thousand Hills Platinum Experience. The Platinum Experience will allow guests to enjoy a good savings worth $750 to the best shows and attractions in town. This offering gives affordable lodging even better to Thousand Hills guests. A multi-night discount can be enjoyed also anytime on either log cabin or condo accommodation. The resort where Branson cabins are located offers easy access to the natural splendor of the Ozarks, camping on the lakeside, fishing on one of the three pristine lakes, or taking a leisurely walk down a nature trail in some of the main parks, all make Branson an awesome place to visit. If you are looking for a convenient and awesome retreat with stunning scenery for just a few nights in Branson, stay at cozy log cabin or in a condo at Thousand Hills. These lodging units are some of the most popular accommodations in the area that provide luxurious and comfortable living with great ambiance in a tranquil environment.